Even the most confident of native speakers can sometimes have doubts about their spelling and grammar. As for learners of English, getting their writing to a really high degree of proficiency can be a real challenge. 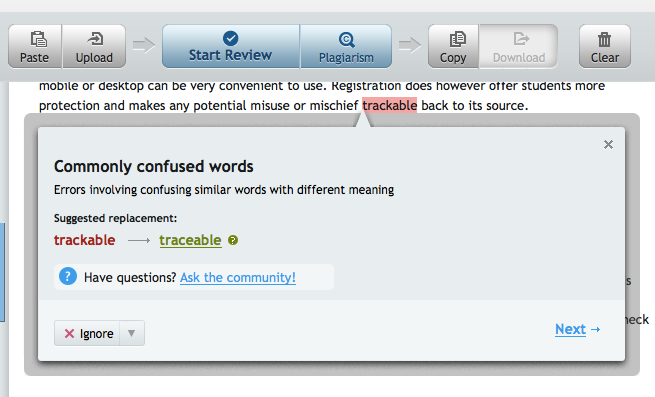 It’s great to have a friend to turn to in moments of doubt or better still someone who will proof read your work and give you a second opinion, but if you don’t have that luxury then the Grammarly plagiarism checker is probably the next best thing. You simply copy and paste your text in, click and Grammarly will read through your work checking a whole variety of different criteria and give you detailed feedback on a whole variety of issues around your text. Unlike most grammar and spell checkers, Grammarly can be set to be sensitive to your genre of writing and make suggestions based upon that. Grammarly highlights areas of potential error and then makes suggestions for you.You can then work through the errors deciding whether you want to correct them or leave them as they are. One really nice feature is the ‘Ask the community’ feature. 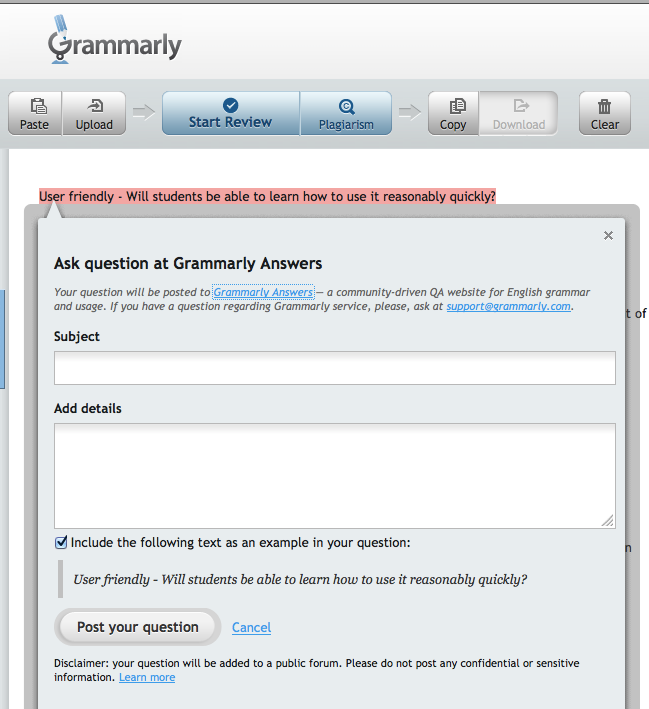 So if you are really unsure whether you or Grammarly is correct you can post a question to the community and see what they have to say. Your question goes onto the Grammarly answers blog and this makes quite interesting reading for anyone with an interest in Grammar and error correction. This would be a great place to get your higher level students reading through problems and trying to decide how to help. Grammarly also gives you explanations why the grammar needs to be corrected, so using this regularly can help you to better understand the rules of English grammar. If you’re feeling that your vocabulary is a bit limited and repetitive, you can also use Grammarly to get suggestions for synonyms to replace some of the word you over use. 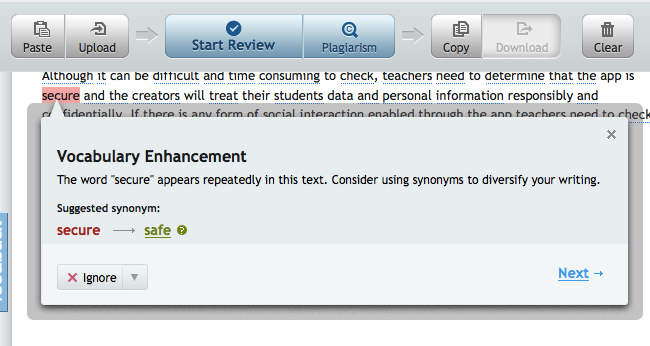 Grammarly is also a very effective plagiarism checker, so if you are writing a long assignment or dissertation and you are worried that you may not have cited all of your sources, Grammarly can check through for you and find the link back to any online source you may have missed. 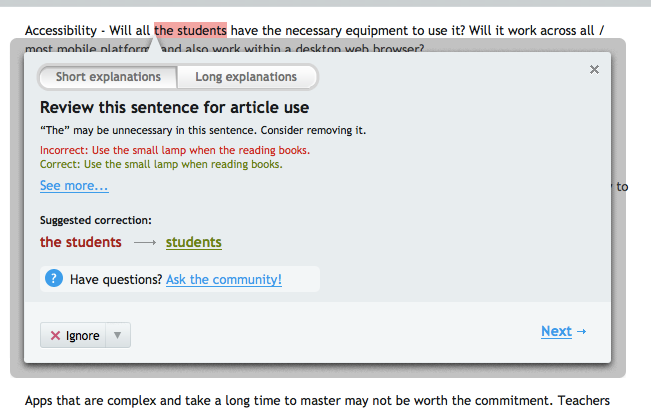 Just out of curiosity I ran one of my previous blog articles through Grammarly. It came up with 72 potential errors. When checking through them, they weren’t all errors, but there were certainly a few, so knowing how hard it is to proof read your own text, I think I could be using Grammarly again. 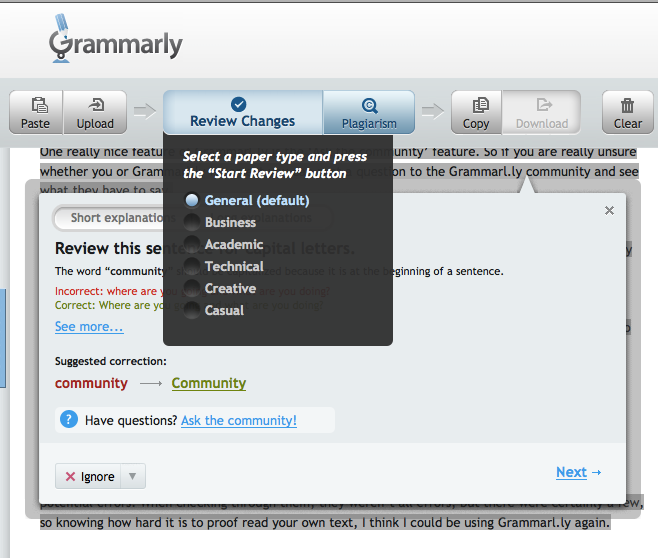 There is of course a catch though as Grammarly isn't free. Whether you are prepared to pay for it though will depend on how much writing you do in English and how important it is to you that it's absolutely accurate. 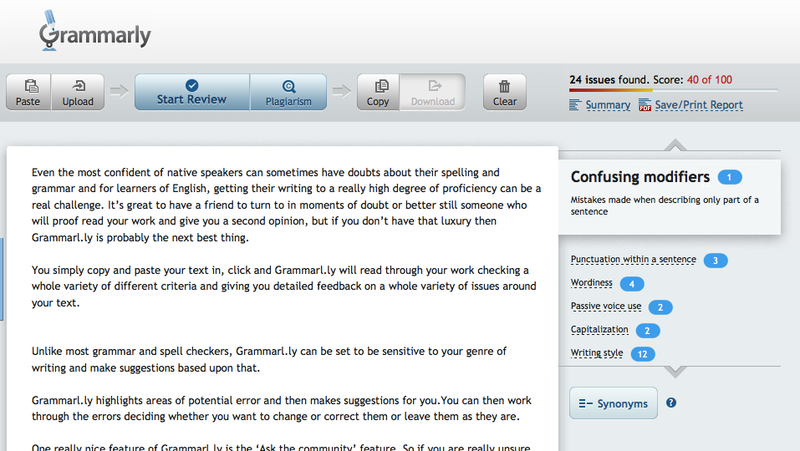 I think for EAP students or teachers who have to do a lot or written work and marking of written work, Grammarly could be a very sound investment and save a lot of time.